On a farm near beautiful Lake Michigan, Donna Hinkelman has created a loving, ever expanding family and a cozy little bear den. She recently celebrated her 55th wedding anniversary with her husband, Carl, and has happily filled the roles of mother (five times), grandmother (twelve times) and great grandmother (twelve times)! Family has always been a big part of Donna's life and her roots in bear-making weave through that integral part of her being. Before she started making bears, Donna collected them. As she collected bears, she began buying bear magazines. 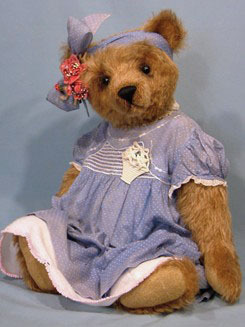 "I think they were a big influence in deciding to create a bear, " Donna recalled. 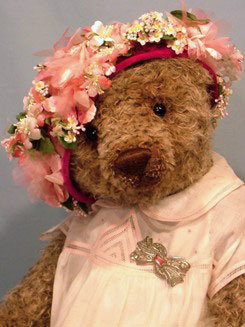 She attended teddy bear shows and became friends with some of her favorite artists. 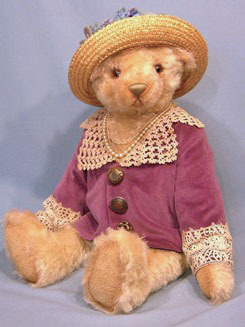 The first bear she made was from an imitation Persian lamb coat that was given to her by her mother. "When my mother passed away in 1967, I created three bears from her coat; two of them were given to my sisters in remembrance of Mom". These first creations were made from purchased patterns but soon Donna decided to make changes to those patterns, adding some different features to them. 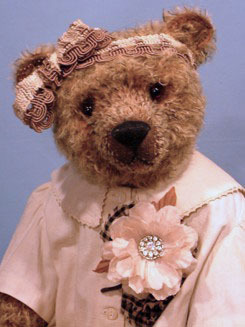 Now she designs all her own patterns and makes the bears in her basement workshop which was designed by her husband, Carl. "He is an accomplished carpenter, cabinet maker and designed a work station to house all the pieces and parts that go into bear making. 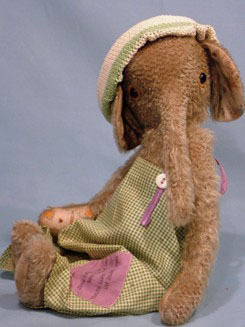 He also makes all the joints for the teddies." 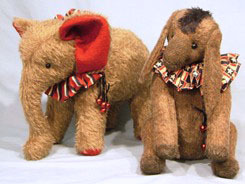 In 1993, Donna began crafting her bears in mohair. 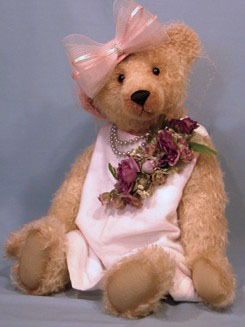 She decided to enter that first mohair bear in the Golden Teddy Awards. 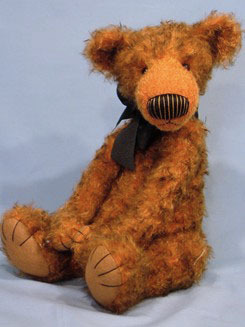 Not only was it a winner, but was featured on the cover of the magazine, Teddy Bear Review. Donna has won numerous awards and nominations though the years and has graced several magazine covers as well. 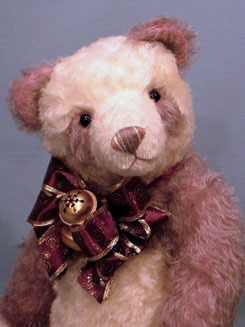 The Bainbridge Bears name was chosen in 1993; the name referred to the township in Michigan in which Donna once lived. 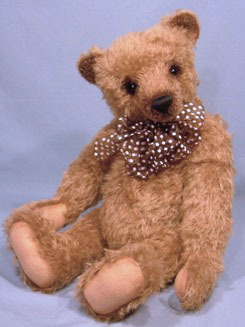 "Making bears was a spare-time hobby back then as I owned and operated a ceramic business. For 27 years I had a wonderful studio and my daughter, Beth Anne and I worked side by side teaching classes for many years. 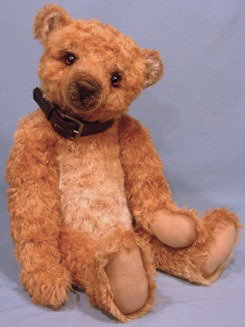 In 1997, we sold the ceramic business and then Beth Anne followed in my footsteps making bears. Her studio name is Bears by Beth Anne." 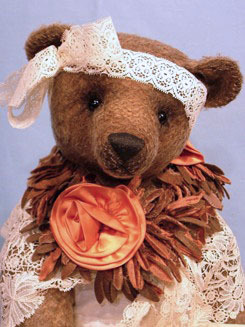 Donna loves to dress her bears and most of them are one of a kind. "I often scour antique malls and second hand stores to find suitable clothing and accessories to give each and every bear his/her own special personality. 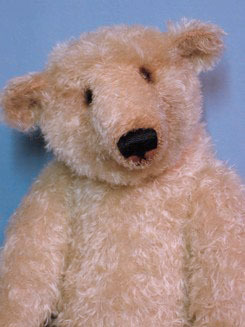 I love the look of a well loved teddy and very often I distress the mohair or airbrush them for a worn appearance." Donna and Beth Anne travel together to teddy bear shows, having a great time with all the bear artists. "Bear folk are the nicest and most wonderful people. They are warm and make my heart happy as do the bears." Her heart must be very happy because her collection of bears now consists of almost 700 wonderful bears. And with grandchildren and great grandchildren visiting, you can be sure that there are more than enough bear hugs to go around.